​The Gorgons are amongst the most famous of monsters to appear in the tales of Greek mythology. Three in number, the most famous of the Gorgons was of course Medusa, the Gorgon encountered by Perseus. In the earliest tales of Greek mythology, as written down by Hesiod in the Theogony, there were three Gorgons, daughters of the ancient sea god Phorcys, and his partner Ceto. Hesiod would name the three Gorgon daughters of Phorcys as Sthenno, Euryale and Medusa. In early texts the location of the place of birth of the Gorgons was also given, this birthplace being subterranean caves found far beneath Mount Olympus. ​It was commonly said that the three Gorgons were born monstrous, and indeed the name Gorgon comes from the word “gorgos”, meaning dreadful or terrible. Early traditions simply describe the Gorgons as monstrous; the Gorgons being winged women with large round heads from which the tusks of swine projected, and also sporting hands of brass. Later traditions provide details of snakes for hair and gaze that turned mortals into stone; although Ovid tells of this power being reserved for Medusa alone. Medusa is normally set apart from the other Gorgons, primarily because whilst Euryale and Sthenno were immortal monsters, Medusa was very much mortal, although why this difference existed can only be explained due to the story of Perseus’ quest. A later version of the Gorgon story also tells of further differences between the Gorgons, for a story tells of how Medusa was not born monstrous but was transformed from a beautiful maiden into the famous monster by Athena. Athena’s anger being directed at Medusa when Poseidon raped the Gorgon in a temple dedicated to the goddess. ​The rationalisation for the existence of the Gorgons came through the belief that the sisters were personifications of hidden reefs onto which a multitude of unwary and unknowing sailors had been wrecked over the centuries. 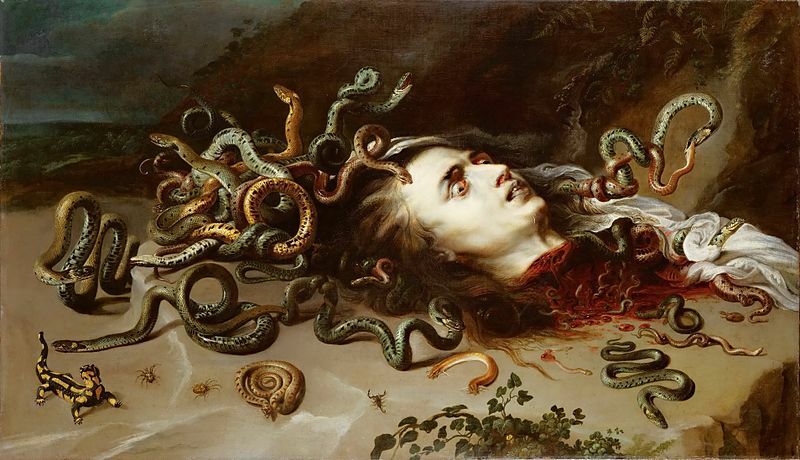 As monsters though, the Gorgons were also said to have preyed upon the unwary, and whilst Medusa is the most famous of the Gorgons, she was not regarded in antiquity as the most deadly, for it was said that Sthenno had killed more people than Euryale and Medusa combined. ​The Gorgons might have had a deadly reputation in Greek mythology, but they only come to prominence when the path of the hero Perseus crosses that of the monsters. Perseus, having grown up on the island of Seriphos, was now quested by King Polydectes to bring forth the head of the Gorgon Medusa; Polydectes wishing to see Perseus killed off, so that he would be free to marry Perseus’ mother Danae. ​Despite being aided by the gods, including Athena, Hermes and Hephaestus, Perseus first had to find out where the Gorgons were to be found. This was a closely guarded secret, a secret known only to the three Graeae, sisters of the Gorgons; Perseus would eventually force the secret from the Graeae, but even then the home of the Gorgons remained known only to Perseus. Ancient writers would suggest various locations for where the Gorgons were to be found, including Tithrasos in Libya, although the most common location for the Gorgons was upon an island group known as the Gorgades, islands located in the Aethiopian Sea. Virgil would specifically tell of the Gorgons being found in the Underworld, observed there by Aeneas, but this was probably where they relocated after Perseus discovered their original home. ​Perseus would arrive at the home of the Gorgons, and located the cavernous home of Medusa. Undaunted by the task ahead, Perseus made use of Athena’s reflective shield to safely approach the Gorgon, and then with Hermes’ sword, the head of the Gorgon was separated from her torso. Donning Hades’ helmet of invisibility, Perseus was then able to make his escape, avoiding the other Gorgons, Sthenno and Euryale, who were coming to the aide of their sister. ​Aside from the recounting of the presence of the Gorgons in the Underworld, the story of Euryale and Sthenno effectively comes to an end with the death of Medusa. Medusa, despite being dead, has further entries in the stories of Greek mythology though. Indeed, the Gorgon Medusa was said to have given birth to the winged horse Pegasus, and the giant Chrysaor, both emerging from the open neck wound let from the decapitation. Blood of the Gorgon Medusa, would bring forth both the coral of the Red Sea as well as the snake of Northern Africa; blood falling in both locations as Perseus travelled with the head of Medusa. Perseus of course made great use of the head of the Gorgon Medusa, for in rescuing the Andromeda, Perseus used the head to turn the sea monster to stone, and also turned to stone Polydectes and his followers when the hero returned to Seriphos. The head of the Gorgon Medusa would then be given to the goddess Athena, who then incorporated it into her own shield; although some of the blood came into the possession of Asclepius who used it in his medicines, whilst a lock of hair was at one point owned by Heracles. ​There is also another Gorgon in Greek mythology, the Gorgo Aix, although it is not as famous as the three sisters encountered by Perseus. The Gorgo Aix, or Gorgon Aix, was a monstrous goat, who was neither male nor female, who appears as a figure in fragmentary tales of the Titanomachy. This Gorgon was commonly named a child of the sun god Helios, who sided with the Titans against Zeus during the ten year Titanomachy. The Gorgo Aix though was killed early in the war by Zeus, who then used the skin of this Gorgon as the base for his aegis, his shield. It was occasionally said that it was the Gorgo Aix who was the parent of the three Gorgons, instead of Phorcys and Ceto.